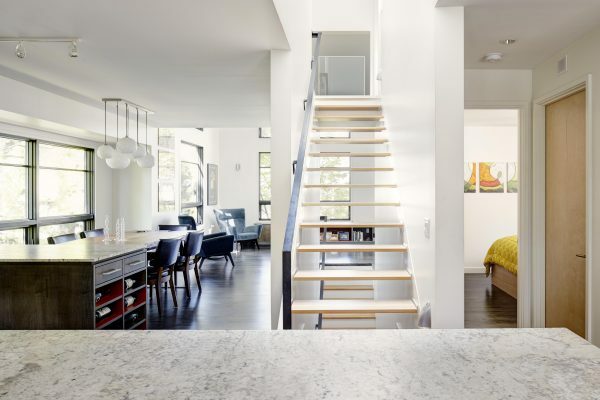 babienko architects was challenged with renovating and adding to an existing home in a modest Seattle neighborhood, without creating a house which was out of scale with the rest of the homes on the street. Removing the applied postage stamp entry, babienko architects reorganized the family’s circulation and living patterns to activate long forgotten spaces. The new lower level entry serves the family’s day to day lifestyle, extracurricular activities, and desire for a welcoming entrance for cocktail party guests. The back of the home was extended into the backyard and the threshold between interior and exterior spaces was broken down into a seamless transition. babienko architects intentionally avoided an uber modern aesthetic and instead developed an interior and exterior vocabulary of craft and detail which captures an understated northwestern contemporary sensibility.